I’m always looking for gluten-free dessert recipes that are easy and inexpensive to make, and this one really hit the nail on the head! Creamy cream cheese and peanutbutter fill a crisp chocolate shell, and the entire process takes about half an hour! These delicious no-bake cupcakes are sure to wow everybody you serve dessert to, whether they have a gluten allergy or not. This was my first time making little chocolate shells, and it was so easy. I’m so excited for all of the other desserts I’ll be able to make now using this technique. Recipe adapted from The Baking Beauties. Using the back of a spoon, or a small pastry brush, coat the inside of 12 mini-muffin liners with the melted chocolate, being sure to coat the sides & the bottom. These will become your edible cupcake liner, so be sure it is thick enough that it will not break. Place chocolate coated muffin liners in a mini muffin tin, and place in the freezer for 20 minutes. With the remaining melted chocolate, we will make chocolate curls to decorate our cupcakes. Using an offset spatula, spread the chocolate in a thin layer on the back of a metal baking sheet. Draw lines where you want the curls to naturally break once the chocolate has cooled slightly. Set the chocolate aside, but keep an eye on it. Once it is no longer shiny, use the back of a metal spatula at about 45 degrees to the pan, scrape the chocolate off the back of the pan, creating curls. NOTE: A thick plastic spatula will not work. In a mixing bowl, or stand mixer, combine the softened PHILADELPHIA cream cheese, sugar and peanut butter until smooth. Using a rubber spatula, stir half of the whipped cream into the PHILADELPHIA cream cheese/peanut butter mixture. Now carefully fold in the second half of the whipped cream. Once the chocolate cupcake liners have set up in the freezer, remove one at a time, and carefully tear the paper liner away from the chocolate. 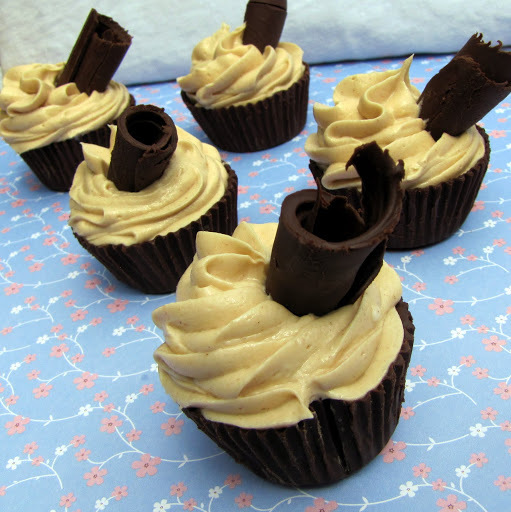 Place chocolate cupcake liner back in the fridge or freezer until ready to use. Repeat until all 12 are complete. 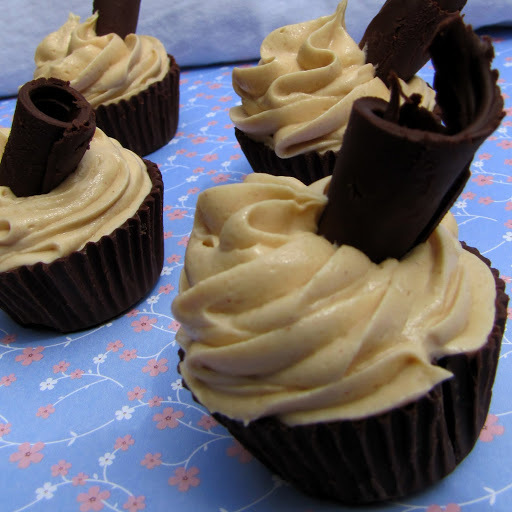 Using either 2 small spoons, or a pastry bag fitted with a large star tip, fill the chocolate cupcake liners with the PHILADELPHIA cream cheese/peanut butter/whipped cream mixture. Mound the filling, making them look like little cupcakes. Top with a chocolate curl. Serve immediately, or keep refrigerated until ready to serve.